It takes a pretty awesome kale salad to get every single person in our family to respond with a “thumbs up”. In fact, it’s never been done before. Until now. Yes, I finally found a kale salad that we can all agree on! 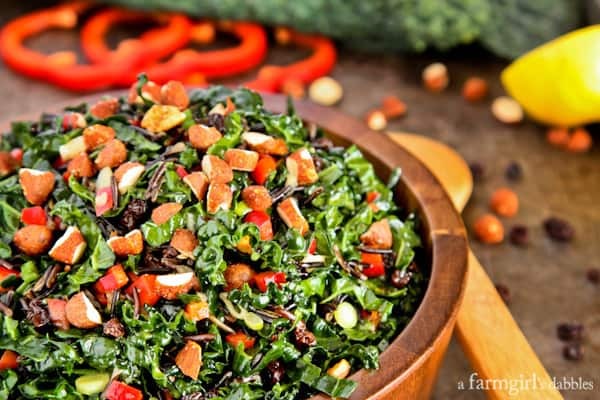 This Kale and Wild Rice Salad with Chipotle Maple Almonds and Zingy Currants is one that I’ll be making again and again. 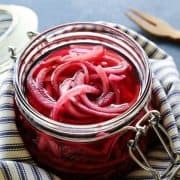 With its sweet and tangy honey lemon vinaigrette, it is bright and flavorful, and bursting with all kinds of goodness. 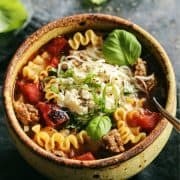 I am grateful to NatureBox for providing me with this opportunity to create this healthy and delicious dish, and for sponsoring this post and giveaway. 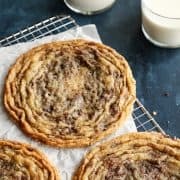 Please, whatever you do…do NOT miss out on this recipe or this giveaway. Read to the end of the post for your chance to WIN 6 months of NatureBox snacks, delivered right to your door! 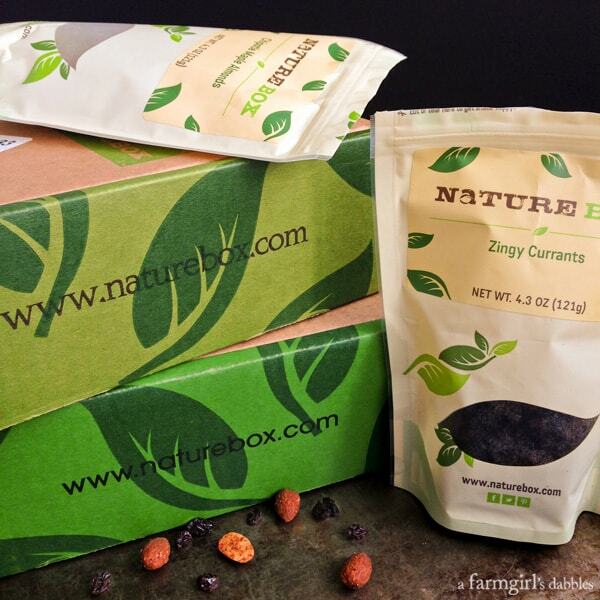 I am so glad I was introduced to NatureBox snacks last summer when I attended the BlogHer conference in Chicago. Besides getting to finally try a number of their snacks, I was able to talk with some of the people behind the company. Both are definitely impressive. I feel quite honored to be working with them, sharing about their goodness. But do you know about NatureBox? And besides being healthy, NatureBox snacks are incredibly tasty. You can check out all of their snacks in their NEW snack catalog. While I think they’re all great, a few of my family’s very favorite NatureBox munchies are BBQ Kettle Kernels, Honeycomb Sunflower Kernels, Sweet Blueberry Almonds (oh my!! 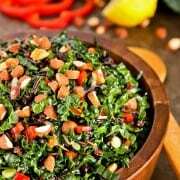 ), Bombay Curried Cashews, Dried Pears, Apple Orchards Granola, Tart and Tangy Fruit Medley…and the Chipotle Maple Almonds that I incorporated into this kale and wild rice salad. If you have yet to be convinced on a great kale salad (like my family once was! ), this is the one to try. It’s a simple salad, packed with so many incredible textures and flavors. Wild rice adds earthy heartiness, while Zingy Currants lend a sweet chew. 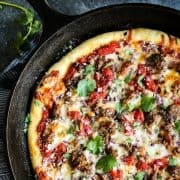 And red bell peppers offer bites of sweetness, plus pretty pops of red. I love to snack on NatureBox’s Chipotle Maple Almonds, and almost didn’t want to “waste” them on my salad. But they really do add just the perfect little amount of spicy kick, with big bold crunch. Guess I’ll just have to keep adding those almonds to my monthly NatureBox order! And the honey lemon vinaigrette that pulls it all together? Our girls kept dipping their fingers into it as I was making this salad, saying they needed to “test it one more time”. I know something is good when that phrase keeps getting repeated! But I do have to agree with the girls…this vinaigrette is pretty awesome. I’ve come to realize that I like kale salads best when the kale is sliced into small “ribbons” or thin strips, also called a chiffonade. Kale also responds to massage well, as Food52 taught me, leaving it softer and sweeter and dare I say, just more relaxed. Here’s how to massage kale…do give it a try! Add sliced kale to large bowl and massage it. Then add wild rice, green onions, red pepper, and Zingy Currants, and fold to combine. In a small bowl, combine lemon juice, white wine vinegar, and honey. Whisk in olive oil until combined. Season with salt and pepper. Drizzle vinaigrette over salad and fold to combine. If serving immediately, sprinkle with chopped Chipotle Maple Almonds. This salad can be prepared up to 2 hours before serving. Just keep it refrigerated and only add the almonds right before serving. If you are creating this salad to eat over the course of a few days (what a great make-ahead lunch idea! 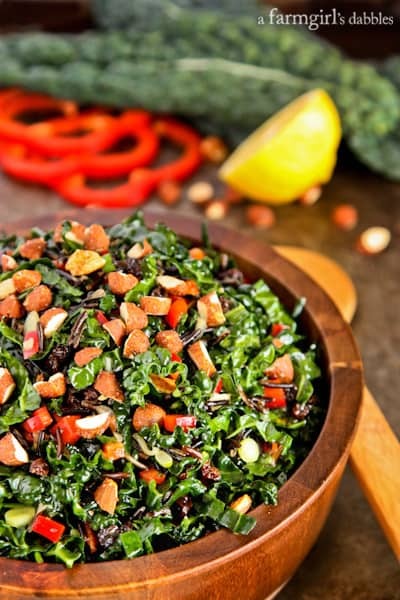 ), simply keep the kale and wild rice salad mixture separate from the honey lemon vinaigrette in the refrigerator. Add the vinaigrette to each individual salad portion, and then top with the almonds. This will ensure that the salad won’t get soggy. Enjoy! And I’m so happy to also share this fun NatureBox Giveaway with you! 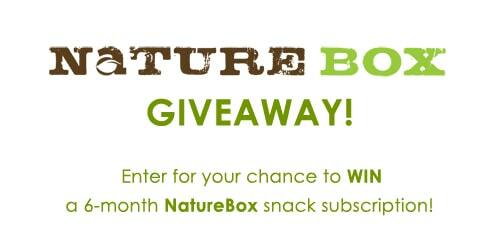 One lucky reader will receive a 6-month snack subscription to NatureBox. It’s so easy to enter this giveaway…just use the automated entry form below! Disclosure: Thank you to NatureBox for sponsoring this delicious recipe post and giveaway. All opinions are my own. I think the SANTA FE CORN STIX look really good. This looks like so much fun! Lots of snacks I would like to try. I have been looking for a new granola since my favorite granola is no longer carried at my grocery store. So I would like to try the french toast granola! Everything looks so tasty!! I would love to try the chili lime pistachios. YUM! I’d like to try the Dark Cocoa Almonds. YUM! Lemon tea biscuits for me, please. The dried fuji apples look great! Sweet Blueberry Almonds — hello?!!!!!! First, I want some blueberry almonds!!! Ok, massaging kale, seriously? I’ve got to check that video out :) We do have a Kale Salad that we all love, even the 14 year old. It’s probably a tad less healthy than this delicious specimen, however! It has cheese all over it. I think the Tuscan Summer Mix sounds amazing, I want to eat it and then to vacation there! Mmmm, the sweet blueberry almonds sound delicious! I would like to try peppery chickpeas and granola! whole wheat blueberry figgy bars! Smoky pumpkin seeds. Love pumpkin seeds! Any of the almonds (my fave nut) or the smoky pumpkin seeds. Mmm..Whole wheat blueberry figgy bars! Salted Carmel Pretzel Pops- yum! I’d love to try the Cherry Berry Bonanza. I would love to try the toasted sesame sticks! I would like to try Pear praline crunch. Oh man this looks so bright and wonderful! I’d most like to try the Whole wheat blueberry fig bars! Cherry macaroon granola! I love granola on my morning granola. I’d like to try the Homestyle Cheddar Mix. Thank you! Dark cocoa almonds look great! The smoky pumpkin seeds look gooood! I would like to try the Honey Crunch Crisps. Look so good. I’d like to try the baked sweet potato fries. Oh those sourdough cheddar pretzels sound so wonderful! It all looks so good. Wow so many choices….we love yogurt pretzels and anything almond! I’d like the french vanilla almond granola! Those chipotle maple almonds sound amazing!! The whole wheat apple pie figgy bars look delicious! The baked sweet potatoes look yummy! Pistachio clusters would probably be my favorite but there is just too many awesome healthy stuff I would eat a whole box! Pistacho Power Clusters look delicious! SO many of the Nature Box snacks look delicious, I would love to try the Salted Caramel Pretzel Pops! Everything looks AWESOME, but if I had to narrow it down to one choice, I would pick… Whole Wheat Apple Pie Figgy Bars!! thanks for the chance to win! Sticks & Stones look yummy! Pear Praline Crunch! That looks soooo good! the roasted kettle kernels sound delish!! The Cocoa waffle wafers look yummy. Thanks! The sourdough cheddar pretzels sound yummy! One of my favorite snack foods is yogurt pretzels. The Yogurt Dipped Pretzels looks delicious and I would like to try them! pistachio power clusters, please! thank you. I would like to try the cranberry almond bites. The whole wheat blueberry foggy bars sound delicious…I mean really, how could you go wrong with that combination!! I love Garden tomato crunchies but the cocoa almonds look good too. The lemon meringue waffles look right up my alley! I’d love to try the roasted kettle kernels. garlic roasted pumpkin seeds yum! The mango almond bites look amazing! I would like baked peppery potato fries. I think the apple pie figgy bars look great. 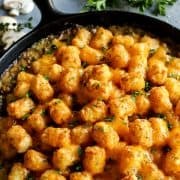 The Citrus Chipotle Chikpeas sound awesome! Yum! I want one of each! But, if I had to choose, I’d love to try the citrus chipotle chickpeas. I’d love to try the peanut butter nom noms! The Cherry Crumble Granola looks delicious! These will be great for daycare lunch boxes. I would love to try the vanilla macaroon granola! I’d like to try the siracha roasted cashews from NatureBox. masa chips look delicious ! The peanut butter nom noms look lovely…and so do the lemon meringue waffles. Banana breAd granola for sure! Beautiful salad! 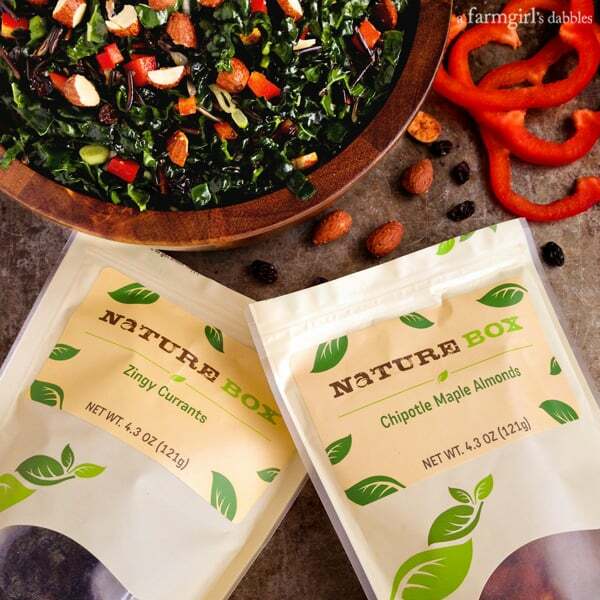 I would love to try Nature Box! I would like to try Banana Bread Granola – yum! Vanilla macaroon granola! Sounds like dessert! Oh my, so many good choices to make from Nature Box… I choose the “DARK CHOCOLATE BERRY TRAIL MIX” as the one I would most love to try though. I really love how you can select your dietary needs and taste preferences to give you an assortment of what kind of snacks you’d like. I wish more boxes would give this type of option. I think the Flax Crostini Bites sound great and they are gluten free! I’d love to try the Seaweed Rice Pops. Praline pumpkin seeds sound amazing. Wow! 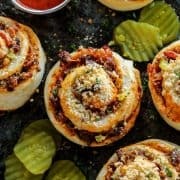 So many neat and tasty looking snacks that it’s hard to choose but I love some spicy so either the Citrus Chipotle Chickpeas or the Sriracha Roasted Cashews look like a great place to start off. 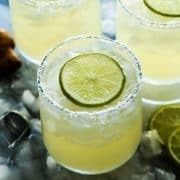 I NEED to try both of those yet…they’re on my list! Thanks for doing the heavy lifting and creating a family-friendly kale recipe, Brenda. Must try! You’re most welcome! Thanks, Anna – have a great week! I want to try the Cherry Berry Bonanza. I can’t believe I still haven’t tried Nature Box. Every post I see with their goodies rocks my socks. I’m all over any of their snacks with almonds. They are my fave, and I eat them like crazy! The everything bagel sticks sound delish! I’d like to try the sourdough cheddar pretzels from NatureBox. chipotle almonds!! Oh man, this is so my kind of salad. I love the flavors and it is so pretty! Those almonds are my perfect snack! Thanks, Tieghan – have a great week! I love the word “zingy” – those currants look great!! And so does this salad. So colourful and yummy! 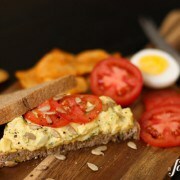 I have GOT to try Nature Box. It pretty much sounds right up my alley in every way. And so does this gorgeous salad!! The baked sweet potato fries sound wonderful!